182. I have already put in my brief in favor of my second cotary proposition, and in what I am about to say I shall treat that as already sufficiently proved. In arguing it I avoided all resort to anything like special phenomena, upon which I do not think that philosophy ought to rest, at all. Still, there is no harm in using special observations merely in an abductive way to throw a light upon doctrines otherwise established, and to aid the mind in grasping them; and there are some phenomena which, I think, do aid us to see what is meant by asserting that perceptual judgments contain general elements, and which will also naturally lead up to a consideration of the third cossal proposition. 183. I will show you a figure which I remember my father [Benjamin Peirce] drawing in one of his lectures. I do not remember what it was supposed to show; but I cannot imagine what else it could have been but my cotary proposition No. 2. If so, in maintaining that proposition I am substantially treading in his footprints, though he would doubtless have put the proposition into a shape very different from mine. Here is the figure (though I cannot draw it as skillfully as he did). 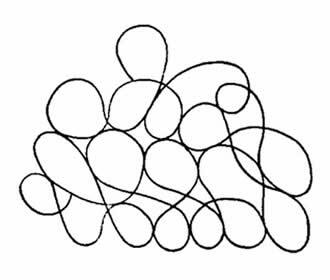 It consists of a serpentine line. But when it is completely drawn, it appears to be a stone wall. The point is that there are two ways of conceiving the matter. Both, I beg you to remark, are general ways of classing the line, general classes under which the line is subsumed. But the very decided preference of our perception for one mode of classing the percept shows that this classification is contained in the perceptual judgment. So it is with that well-known unshaded outline figure of a pair of steps seen in perspective. We seem at first to be looking at the steps from above; but some unconscious part of the mind seems to tire of putting that construction upon it and suddenly we seem to see the steps from below, and so the perceptive judgment, and the percept itself, seems to keep shifting from one general aspect to the other and back again. In all such visual illusions of which two or three dozen are well known, the most striking thing is that a certain theory of interpretation of the figure has all the appearance of being given in perception. The first time it is shown to us, it seems as completely beyond the control of rational criticism as any percept is; but after many repetitions of the now familiar experiment, the illusion wears off, becoming first less decided, and ultimately ceasing completely. This shows that these phenomena are true connecting links between abductions and perceptions. 184. If the percept or perceptual judgment were of a nature entirely unrelated to abduction, one would expect that the percept would be entirely free from any characters that are proper to interpretations, while it can hardly fail to have such characters if it be merely a continuous series of what, discretely and consciously performed, would be abductions. We have here then almost a crucial test of my third cotary proposition. Now, then, how is the fact? The fact is that it is not necessary to go beyond ordinary observations of common life to find a variety of widely different ways in which perception is interpretative. 185. The whole series of hypnotic phenomena, of which so many fall within the realm of ordinary everyday observation — such as our waking up at the hour we wish to wake much nearer than our waking selves could guess it — involve the fact that we perceive what we are adjusted for interpreting, though it be far less perceptible than any express effort could enable us to perceive; while that, to the interpretation of which our adjustments are not fitted, we fail to perceive although it exceed in intensity what we should perceive with the utmost ease, if we cared at all for its interpretation. It is a marvel to me that the clock in my study strikes every half hour in the most audible manner, and yet I never hear it. I should not know at all whether the striking part were going, unless it is out of order and strikes the wrong hour. If it does that, I am pretty sure to hear it. Another familiar fact is that we perceive, or seem to perceive, objects differently from how they really are, accommodating them to their manifest intention. Proofreaders get high salaries because ordinary people miss seeing misprints, their eyes correcting them. We can repeat the sense of a conversation, but we are often quite mistaken as to what words were uttered. Some politicians think it a clever thing to convey an idea which they carefully abstain from stating in words. The result is that a reporter is ready to swear quite sincerely that a politician said something to him which the politician was most careful not to say. I should tire you if I dwelt further on anything so familiar, especially to every psychological student, as the interpretativeness of the perceptive judgment. It is plainly nothing but the extremest case of Abductive Judgments. 186. If this third cotary proposition be admitted, the second, that the perceptual judgment contains general elements, must be admitted; and as for the first, that all general elements are given in perception, that loses most of its significance. For if a general element were given otherwise than in the perceptual judgment, it could only first appear in an abductive suggestion, and that is now seen to amount substantially to the same thing. I not only opine, however, that every general element of every hypothesis, however wild or sophisticated it may be, [is] given somewhere in perception, but I will venture so far as to assert that every general form of putting concepts together is, in its elements, given in perception. In order to decide whether this be so or not, it is necessary to form a clear notion of the precise difference between abductive judgment and the perceptual judgment which is its limiting case. The only symptom by which the two can be distinguished is that we cannot form the least conception of what it would be to deny the perceptual judgment. If I judge a perceptual image to be red, I can conceive of another man's not having that same percept. I can also conceive of his having this percept but never having thought whether it was red or not. I can conceive that while colors are among his sensations, he shall never have had his attention directed to them. Or I can conceive that, instead of redness, a somewhat different conception should arise in his mind; that he should, for example, judge that this percept has a warmth of color. I can imagine that the redness of my percept is excessively faint and dim so that one can hardly make sure whether it is red or not. But that any man should have a percept similar to mine and should ask himself the question whether this percept be red, which would imply that he had already judged some percept to be red, and that he should, upon careful attention to this percept, pronounce it to be decidedly and clearly not red, when I judge it to be prominently red, that I cannot comprehend at all. An abductive suggestion, however, is something whose truth can be questioned or even denied.